White Raven Law offers indigenous communities an innovative approach to handling legal challenges with integrity and compassion. White Raven brings a uniquely indigenous perspective to providing legal advice and representing indigenous peoples in Canada. Blending traditional knowledge with modern technologies, we seek solutions with integrity in ways that save time while producing positive results. In all we do, we strive to be as innovative as the White Raven. In carrying out our mission, we are committed to the principle of supporting the development of indigenous communities as self-sustaining and governing nations. INNOVATION. INTEGRITY. TRUTH. COLLABORATION. RESULTS. Our logo draws upon a fundamental oral tradition from the Northwest coast in which Raven brings light to the world. Raven is a cultural hero who brings about the earth as we know it through a series of events, tricks and accidents that have come to be called "Raven traveling" stories. This legend tells of the time a long, long, time ago, when human beings first occupied the earth and it was dark, completely without light. At this time, Raven was white. All of the supernatural beings asked Raven to obtain the light for the earth, which a Chief kept in a fine, old growth cedar bentwood box. Raven transformed himself into a grandchild born into the Chief's family. He quickly grew as a child and eventually cajoled the light from his grandfather. When he secured the light he took it and flew through the smoke hole in the longhouse, and in doing so became black. We chose the white raven logo because it represents Raven in the purest form, sacrificing to bring light to the world for the betterment of all of humanity. — Terri-Lynn Williams-Davidson B.Sc., LL.B. 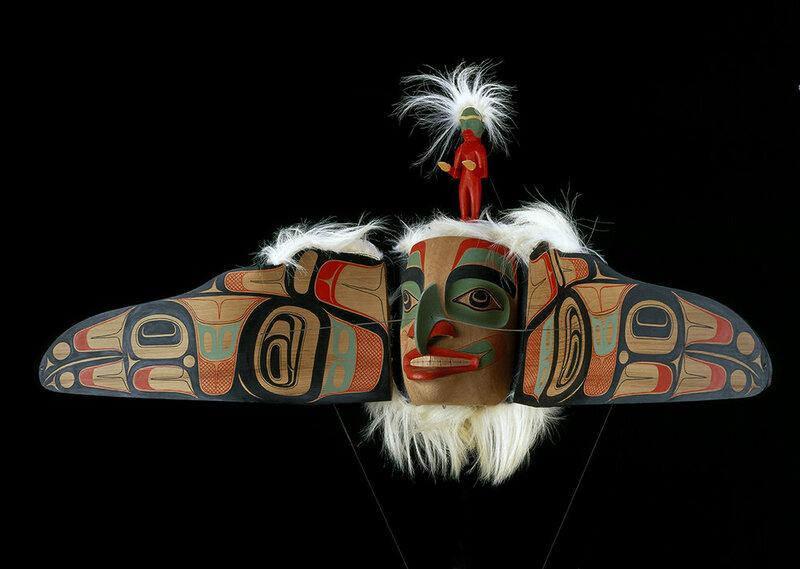 "Raven Transformation Mask" by Robert Davidson, 2009. The images above show the mask in open and closed positions. Photos by Kenji Nagai.